Being Asian, I'm a sucker for all Asian food - whatever cuisine it may be. We often go to eateries in the suburbs of Flemington, Burwood and Ashfield when we're in the mood for a cheap, wholesome Asian feed and always leave feeling extremely full and satisfied. 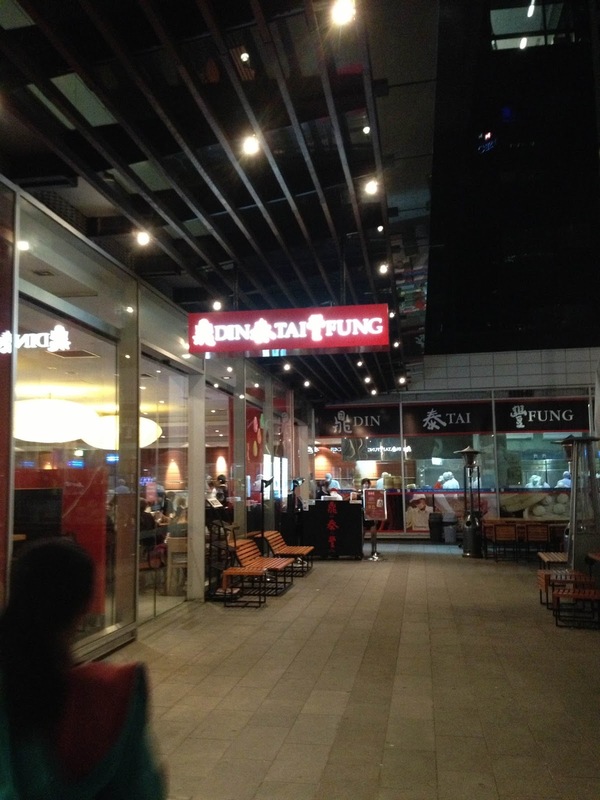 Din Tai Fung, being the only one of its kind in the whole city, is a little on the higher end of the market and is one of our favourite Sydney CBD haunts. I don't know whether it's the atmosphere of lining up and waiting for our buzzer to buzz, or the efficiency of the service, or the way you can see the dumplings being made in the steamy windows, but there's always something special about going there. 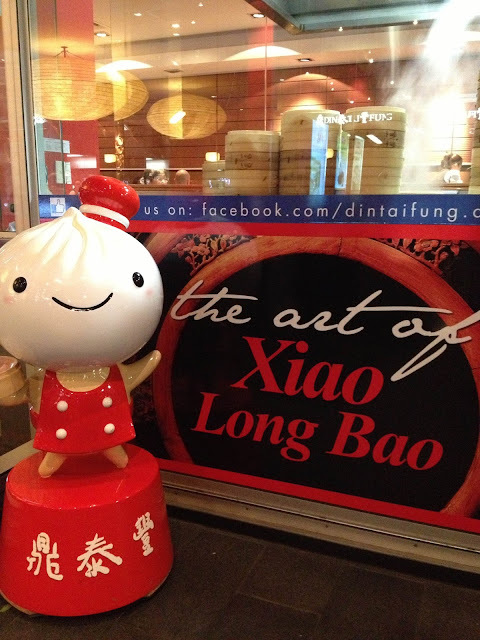 Cute little Xiao Long Bao man! 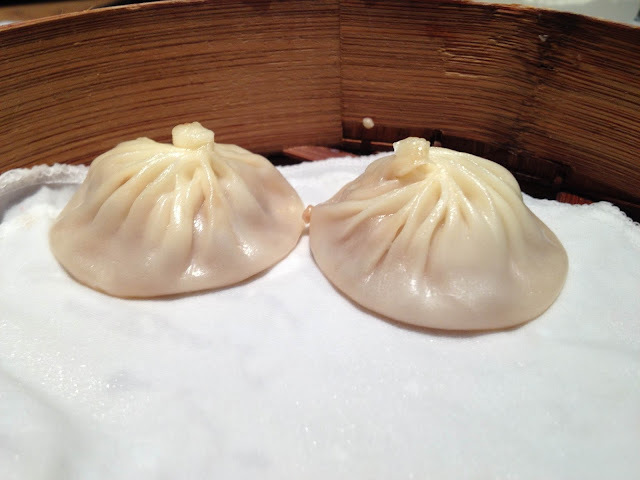 A visit to DTF isn't a visit to DTF without ordering Xiao Long Bao - perfectly crafted, pork-filled dumplings that exert a hot, tasty broth when bitten in to - one of their specialties. 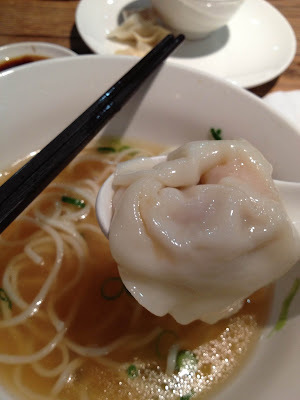 We've tried various other versions of this dumpling at Taiwanese restaurants around Sydney (New Shanghai, Taste of Shanghai) but it's always Din Tai Fung's Xiao Long Baos that we love the best. Where other versions might have a much sturdier, thicker pastry that encloses the porky filling, DTF's paper-thin pastry with it's gingery, flavoursome meat filling is the most flavoursome, the one we always find ourselves returning to. 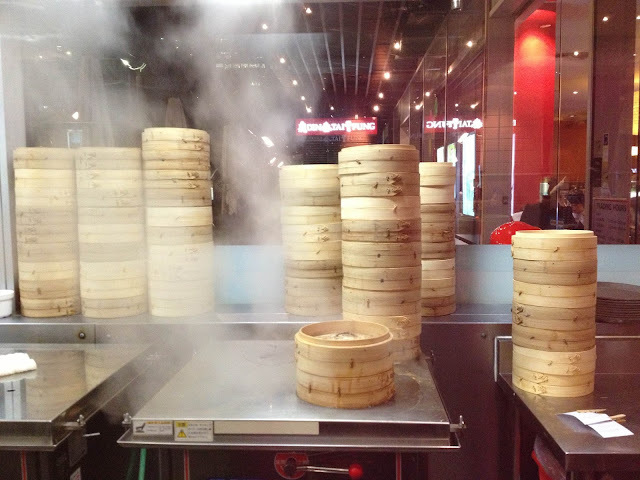 Perfecting the technique of making and steaming these dumplings just perfectly really is an art in itself. Perhaps the only trouble I have when eating them is the short waiting period that is compulsory to let them cool down (so no tongues are burnt), and the fact that the dumpling 'skin' can be so thin and fragile that it's hard to pick up with chopsticks without breaking it and letting the precious broth spill out (NOOO!). Normally we'd walk up the stairs to the World Square Restaurant to find the outside waiting area crowded with hungry patrons waiting for their tables, but seeing as we'd come at 8pm on a Sunday night, the place was deserted (much to our surprise and delight) - YAY! We walked straight inside to find it still quite busy, the waiters bustling around carrying stacks of hot steamers to tables that sat either waiting patiently for their orders or enjoying their hot noodles and dumplings. Patient workers from the kitchen, laden in their whites and with caps and a face mask on, wait in the corner for a waiter to take the steamer of food from them so that they can return to the kitchen. It is this brisk, orderly process of handling the orders, which are written down on a form attached to a clipboard to be collected by a waiter, that sets DTF apart from many other Chinese restaurants. The seating is a mix of small and large tables, as well as banquettes that line on side of the restaurant on a slightly raised tier. Don't be surprised to find yourself sharing a table with other patrons, especially if you are a small group on a busy day (this cuts down the lengthy waiting periods, good if you're hungry). Being a family of 5, we often wait for 20-30 mins until a table is ready for us, but the collection of shops downstairs is more than enough to pass the time. We ordered Xiao Long Bao, which arrived within 15 mins in steaming baskets that were opened on the table to reveal beautiful, perfect little pork-filled gems. When picked up some would unwillingly attach themselves to our chopsticks (from the steaming process they'd become naturally sticky on the outside), but nevertheless they were full of flavour and porky goodness. 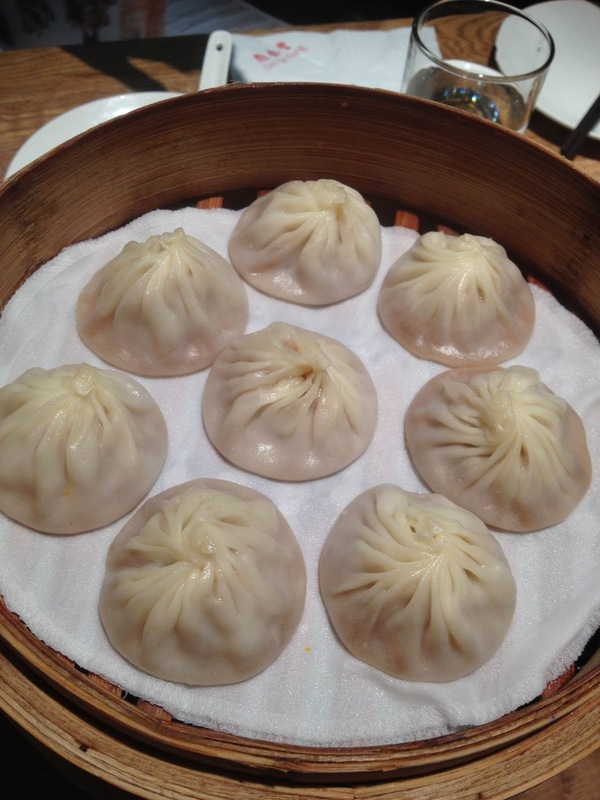 Some say the best way to eat xiao long bao is by nibbling at the pastry, letting the soup come out and drinking it before eating the dumpling. I like to pop the whole dumpling in my mouth (provided it's had some time to cool down) to enjoy the instantaneous explosion of soup and meat that spills out from the wrapping that encloses it. Whichever way you choose, dipping the dumpling into the soy-vinegar concoction that you can mix yourself at the table is a must, with the slivers of fresh ginger in the condiment dish providing just the right hit of hotness. 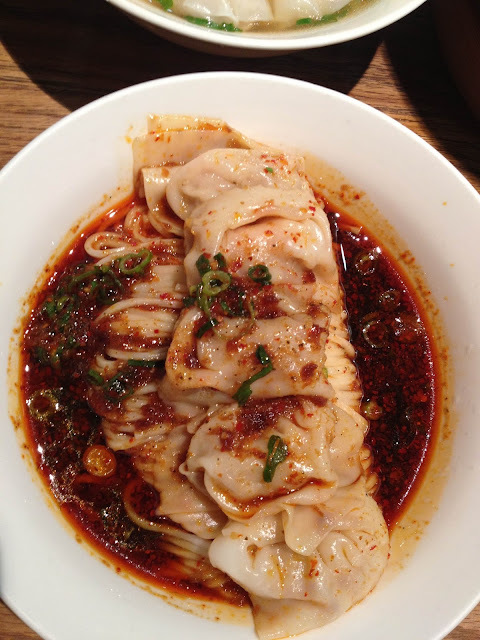 Another regular order is the Won Ton noodles, which consist of 5 plump prawn and pork-filled won tons (more dumplings!) 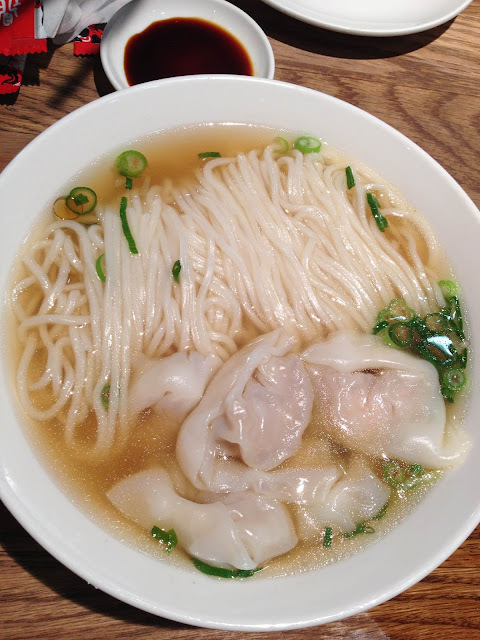 and Taiwanese style rice noodles in a clear broth. The broth itself is quite plain - great if you're in the mood for a clean-tasting soup. While the noodles are lovely and slippery, so too are the won tons, which provided some trouble when I tried to dip them into the soy-vinegar sauce. The braised beef noodle soup is a classic Taiwanese noodle soup with a deep, almost medicinal beefy flavour - much different to the Vietnamese variety of Pho. 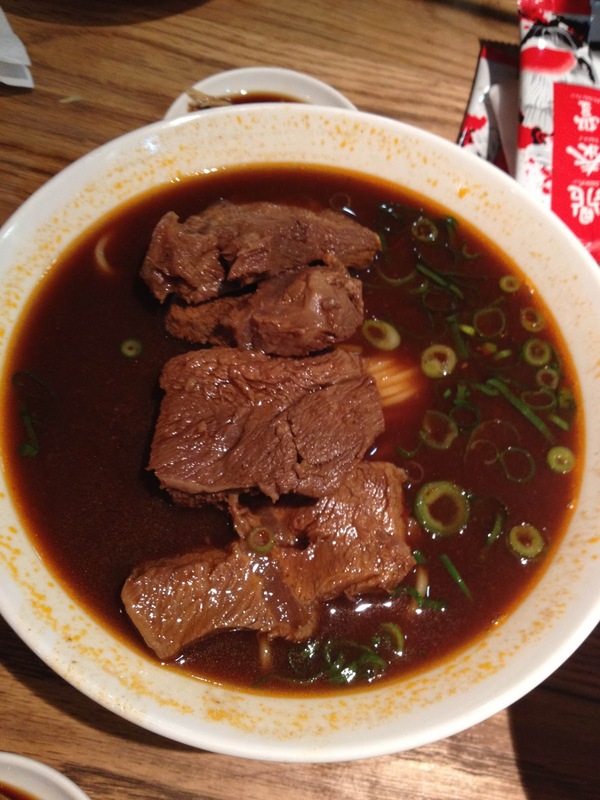 It comes with the same thin rice noodles that take on a lovely flavour from the soup, as well as wonderfully tender pieces of beef that are almost stringy in texture. One time when eating at DTF we thought we'd try the black sesame steamed buns for dessert, and since then they've fast become one of my favourite snacks EVER. We always order one whenever we visit. 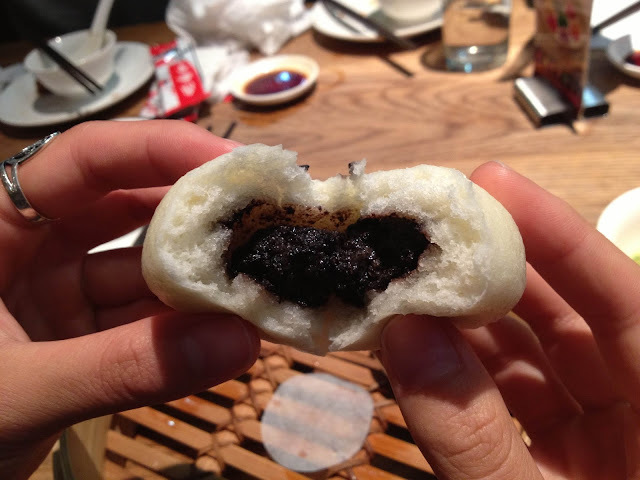 It is the perfect combination of black sesame, a popular Asian dessert flavouring, and bao - a fluffy Chinese steamed bun. Plus, it is always just the right size for an after-meal indulgence, and not too overly sweet either. Studded with three black sesame seeds on top, one will open the bun to find a steaming black sesame paste that oozes out of the bun's crevice. It is surrounded by the lightest, softest bread that complements the filling perfectly. Oh my gawd. I'm in food heaven. 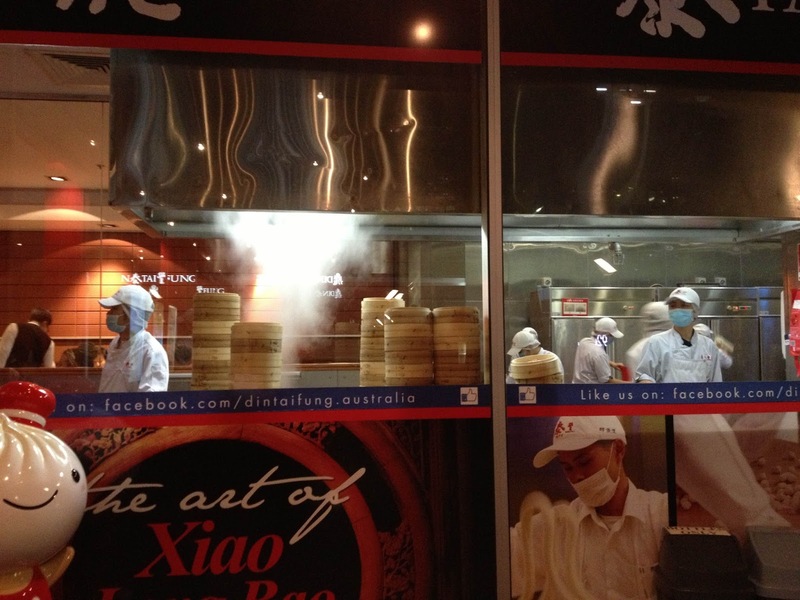 Din Tai Fung never fails to please. 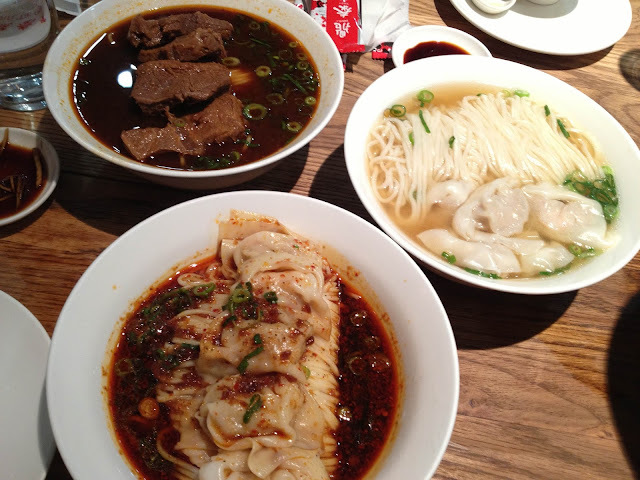 Though the prices are a little higher than you'd expect to pay for a bowl of noodles or a steamer basket of dumplings, just remember that DTF is a one-hatted restaurant and that every cent you pay will be worth it . The atmosphere, the awe, and the art that goes into crafting every single dumpling (which is subsequently weighed and counted for their number of pleats) and dish is an experience unlike any other you will ever experience in the world. Also branches in Westfield Sydney (Level 5 Food Court) and The Star Sydney (Café Food Court).